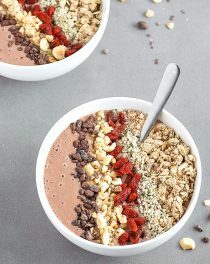 This chocolate peanut butter smoothie bowl is a quick, easy, and delicious way to kick-start the day. Thick, creamy and rich, it tastes just like a dessert. 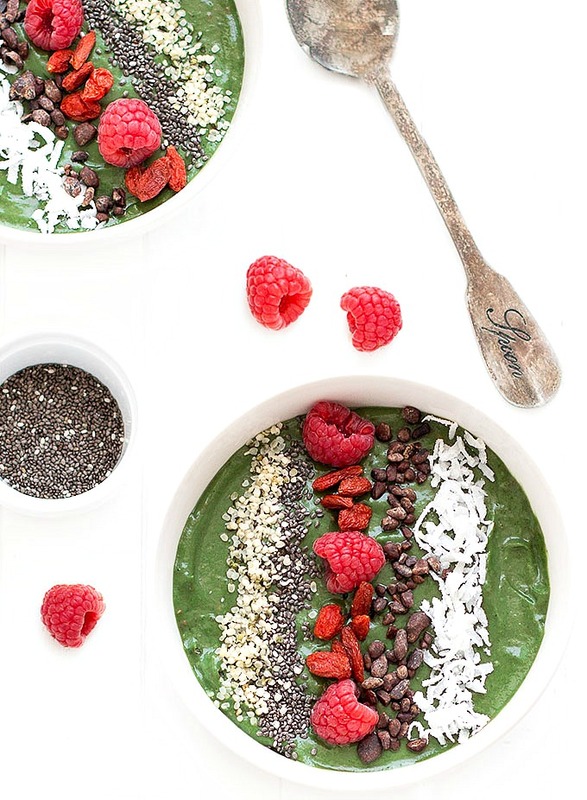 A smoothie bowl is made exactly like a smoothie, just slightly thicker. 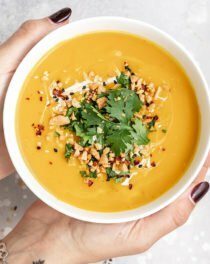 All you need is a blender and 4 ingredients (plus toppings) – whizz everything together, place the smoothie in a bowl and add your desired toppings. You can make smoothie packs ahead of time and just blend it in the morning for a fast breakfast. They are totally customizable. You don’t like almond milk? 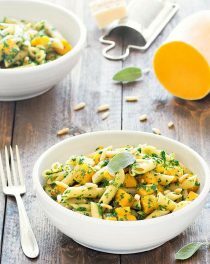 Use coconut milk or regular milk. Not a fan of peanut butter? Try using almond butter. Want more protein? Replace the milk with Greek yogurt. 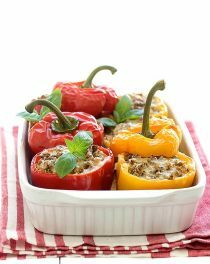 You can switch up your toppings so you’ll never get bored! 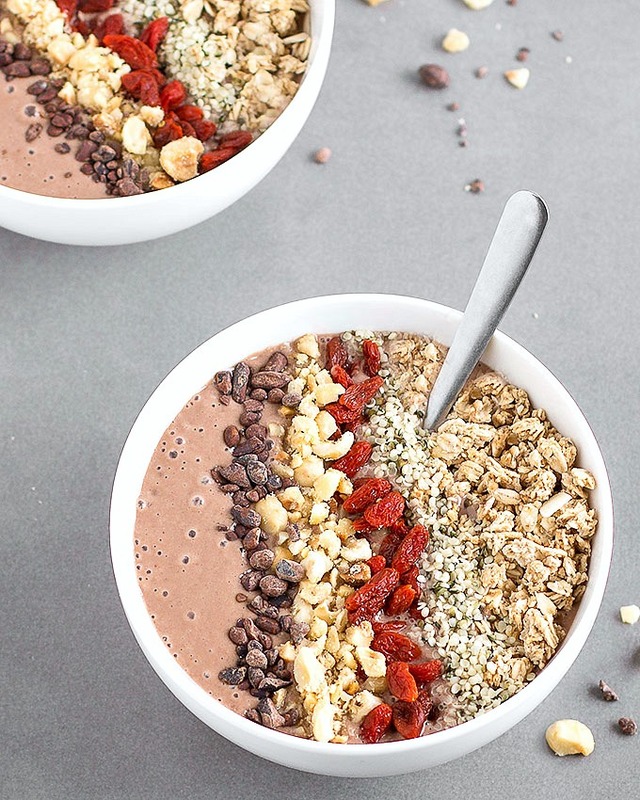 Top this chocolate peanut butter smoothie bowl with whatever tasty garnishes you have on hand. I used goji berries, hemp seeds, cacao nibs, homemade granola, and toasted hazelnuts but you could also add chia seeds, avocado, unsweetened coconut flakes, fresh fruits, berries, etc. If you use unripe bananas, you may need to add honey or sugar. 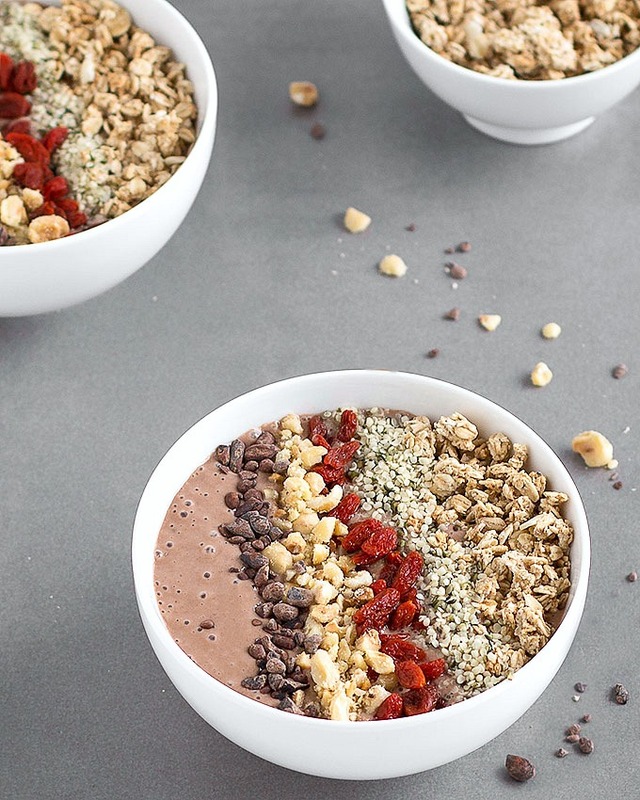 Nutrition information is a for 1 chocolate peanut butter smoothie bowl without toppings. Other options: fresh or frozen berries, sliced banana, bee pollen, pumpkin seeds, sunflower seeds, coconut flakes, etc. Add all the ingredients to a blender and blend until creamy and smooth. You can adjust the amount of almond milk to make it thicker or thinner, depending on how you enjoy it. The desired consistency is like soft serve ice cream. Divide the smoothie between 2 bowls and garnish as desired.